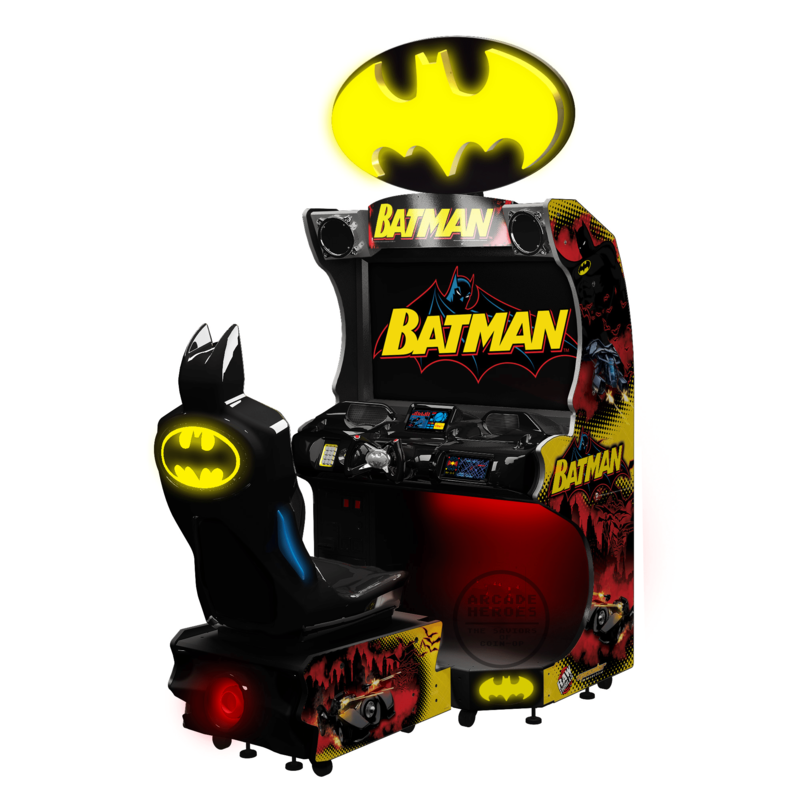 Batman is returning to arcades at the end of this year with Raw Thrills/Specular Interactive’s BATMAN arcade game. Earlier this year we got our first look at the cabinet and some very early footage of the game in action but there is more to dig up about it. Specular Interactive was the developer of this game and when they released H2Overdrive back in 2009, I had the opportunity to interview the company founder, Steven Ranck, who came up with the idea for Hydro Thunder back when he worked for Midway, among many other things. With the pending release of Batman I have that opportunity again so let’s jump right into it and find out what the deal is with their latest arcade creation. Click on any image below for a full view. Some new video footage is also found below, giving us a little better idea of how the game looks in motion than the early beta footage we saw previously. Adam Pratt, Arcade Heroes(AH): We have been following the progress of Specular Interactive since H2Overdrive was revealed. With the upcoming release of your third game, how has that progress fit in with your expectations of when you first created the company? I’m very happy with the progress Specular has made over the years, especially considering that we’ve focused exclusively on arcade games to date. We started out with line 1 of code, sitting around some folding tables, and have grown into a state of the art facility with powerful tech, an incredibly capable & experienced team, three great games under our belts, and a trove of really cool game ideas we hope to bring to light over the coming years. 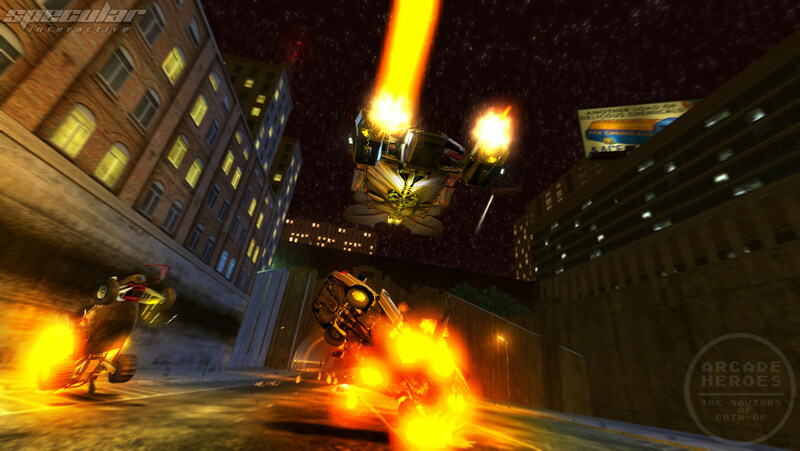 AH: The last time Specular was in the news was with Dirty Drivin’. How did that release compare to the various arcade titles you have worked on? SR: We formed Specular just before the recession hit, so we were a little nervous about how H2Overdrive would end up doing. But despite the challenging global economy at the time, H2Overdrive has exceeded our goals, and continues to sell even after 4 years of its release. I’m extremely proud of Dirty Drivin’. It’s a really fun and unique arcade game, and continues to sell around the world. We’re hoping to reach H2Overdrive numbers with DD, though it may take several years. AH: The next release is Batman. What brought about the idea for that? SR: By the time we wrapped up Dirty Drivin’, Specular had developed a stockpile of really cool and unique arcade game concepts. One that bubbled to the top in light of the latest Batman movie was a game we simply called Batmobile. The idea was simple – you are Batman and drive your choice of Batmobile through the open streets of Gotham City, battling bad guys and ridding the city of crime. We fleshed out the idea and put together a pitch deck to send out, Raw Thrills picked it up, and the project was off the ground! AH: Can you get into details about the team behind this game, how large it was and the overall effort needed to produce Batman? SR: Batman was an incredibly challenging game for Specular to design and develop with our small team. For example, we knew the Batmobile had to drive really fast to give the player the level of excitement we wanted. But being able to take 90 degree corners at city intersections while driving hundreds of miles-per-hour was a real challenge, and often resulted with the Batmobile slamming into the buildings on the opposite side of the road. 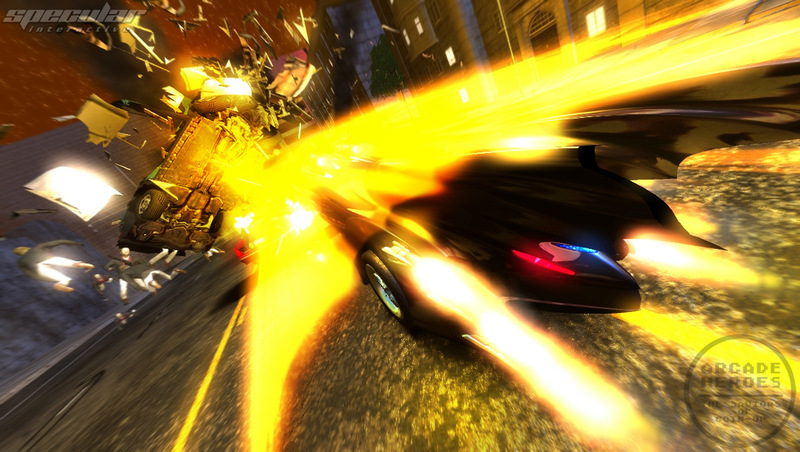 To solve this, Specular engineered a unique driving physics model that allows players of any skill level to drive the Batmobile at insane speeds and still make those 90 degree corners like a pro Hollywood stunt driver, and without giving up any player control over the car. Aside from the many engineering challenges, building an entire city was a huge amount of work. Gotham City in our game is nearly 10 square miles of various suburbs, unique neighborhoods, elevation changes, tunnels, bridges, hills, dirt roads, jumps, secret paths, etc., all hand crafted by a few very talented artists here at Specular. We placed tens of thousands of lights, thousands of physics objects, trees, bushes, effects, moving traffic cars, emergency vehicles & aircraft, ruined buildings and debris, gave names to neighborhoods, streets, and storefronts, and built famous landmarks from the DC Batman universe. It was a huge effort, but the end result is a fantastic rendition of Gotham City to experience. We also have 20 characters in the game with nearly 1,000 lines of spoken dialog, 3 fully animated boss characters, 36 missions over 6 stages, 10 Batmobiles, and the flying Bat. And it’s all playable in both single-player and multi-player at 60 FPS. Batman was also very challenging from a design perspective because to our knowledge nothing like this had ever been done in the arcade setting before. We didn’t have many of the answers when we began working on the project. But through a lot of hard work and iteration, we figured out and pulled together the game’s design piece by piece. 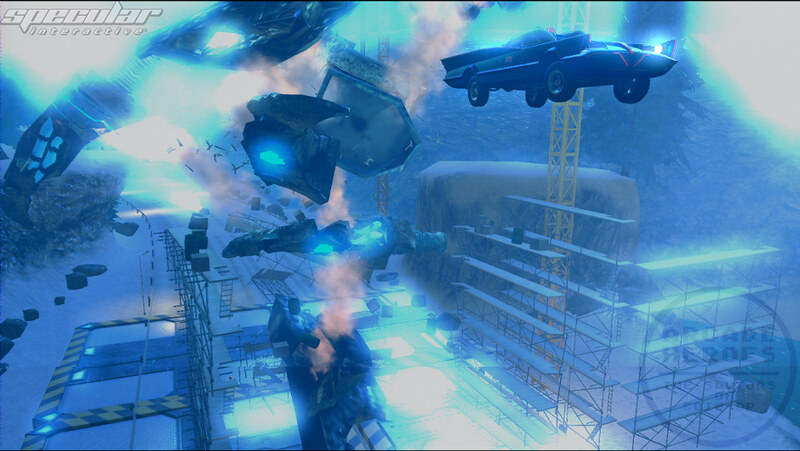 AH: Dirty Drivin’ was something of an evolution of H2Overdrive, and Batman looks like it has some elements of Dirty Drivin’ with vehicular combat. How will Batman differ from DD, apart from the license? SR: Although both DD and Batman have vehicular combat elements, that’s about all they have in common. DD is a racing game with a starting line and finish line. You pick up weapons along the track which you can use to slow down your opponents so that you can reach the finish line before them. You pay for one race and the game is over when you reach the finish line. 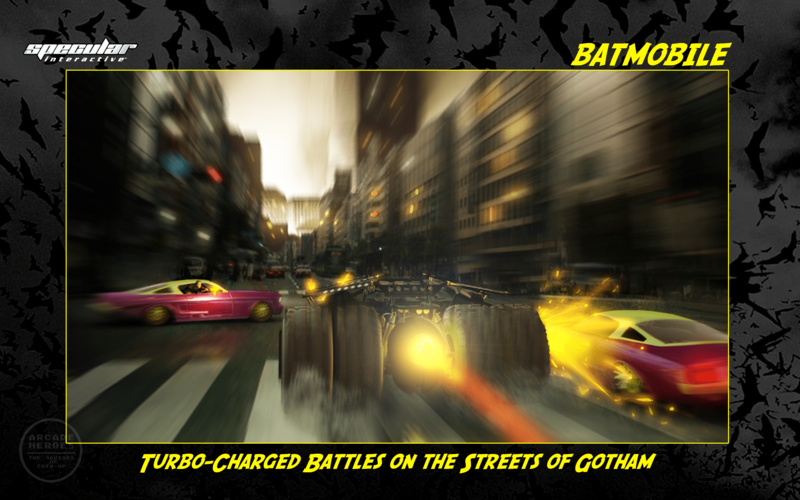 Batman, on the other hand, is a mission-based vehicular combat game where the player isn’t confined to a track but can instead roam almost anywhere in Gotham City to seek out and combat the bad guys. 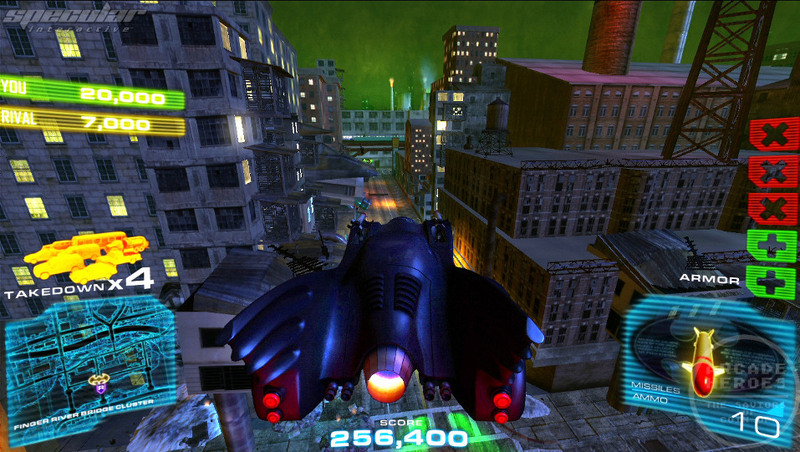 The player is given missions by Commissioner Gordon, and then you set to the streets in your powerful Batmobile armed to the teeth with weapons and gadgets to accomplish the mission. At the end of a set of missions, Batman goes face to face with Mr. Freeze, Bane, or The Joker. AH: Most of the titles you have created are original IPs, how different was it to do a licensed property? SR: Not all that different, really. Specular worked with Warner Bros. very closely throughout the entire development cycle from start to finish, making sure they were happy with the content we were producing. The entire process went very smoothly. AH: Originally this was called Batmobile, why the name change? SR: We initially came up with the name Batmobile because it describes the basis of the game in a single word. At Specular, we use project codenames during development because we know the official name of the game could change at any moment. H2Overdrive was project Triton, Dirty Drivin’ was project Vulcan, and Batman was project Zeus. In the end, we go with an official name we feel has the best public appeal and recognition. AH: How many Batmobiles can be selected by the player? Did that number ever change? 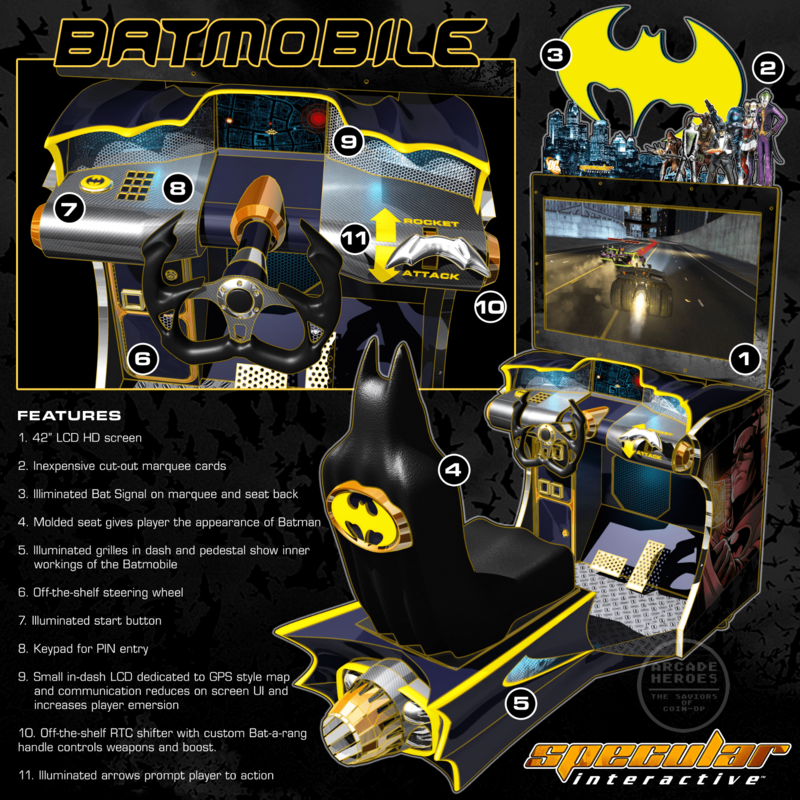 SR: The game has 10 Batmobiles plus the flying Bat vehicle from The Dark Knight Rises. 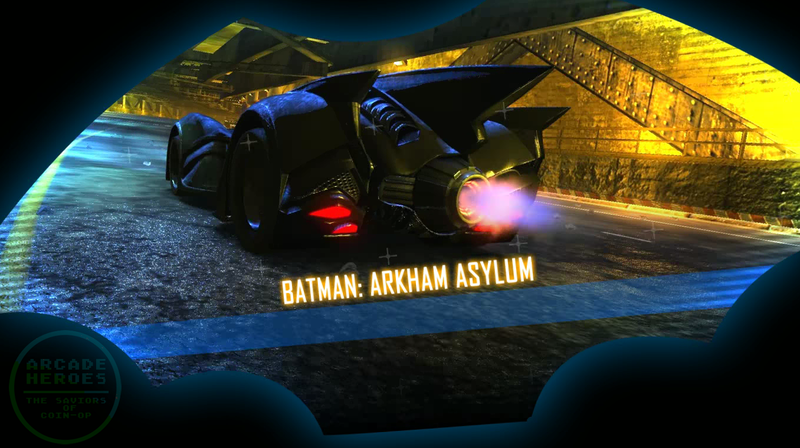 Something we’re very excited about is that the Batmobile from the Batman: Arkham Asylum video game is one of the cars that can be driven in our game! This amazing Batmobile was designed for Rocksteady Studios’ Batman: Arkham Asylum, and fans went crazy for it. However, it was used as a set piece and wasn’t drivable in the game. Specular’s Batman game finally lets fans drive the Arkham Asylum Batmobile! It’s one of my favorites, personally. AH: What was the process like for selecting and designing that many vehicles? SR: First, the Specular team came up with a list of our favorite Batmobiles of all time. We then talked to Raw Thrills and a lot of other people, and scoured the Internet to get a feel for which Batmobiles were fan favorites, and eventually whittled the list to our final 10. When it came time to model the Batmobiles, we used a combination of sources from Warner/DC art, fan art, Internet images, and toys as reference. AH: How many major revisions did the game have to go through from alpha form to reach the final build? SR: From Alpha to the final build, not many. But from inception to Alpha, Specular iterated substantially until we were happy with how the game played. It’s hard to say how many versions there were throughout that processes, but I’d guess maybe 3 or 4 major revisions of gameplay. Batman isn’t a quick and dirty video game based on the Batman license. We worked really hard to build a high quality and engaging arcade game from the ground up. AH NOTE: This video is also from the game’s attract mode, which shows a montage of the game in action. AH: A majority of driving games on the current arcade market are circuit-based racers. How is Batman different and why did you decide to go in that direction? SR: As we were exploring various design directions, Specular did consider going with more of a predefined circuit rather than an open city. But in practice, confining the player for this type of game just didn’t feel right for most of the missions we wanted in the game. 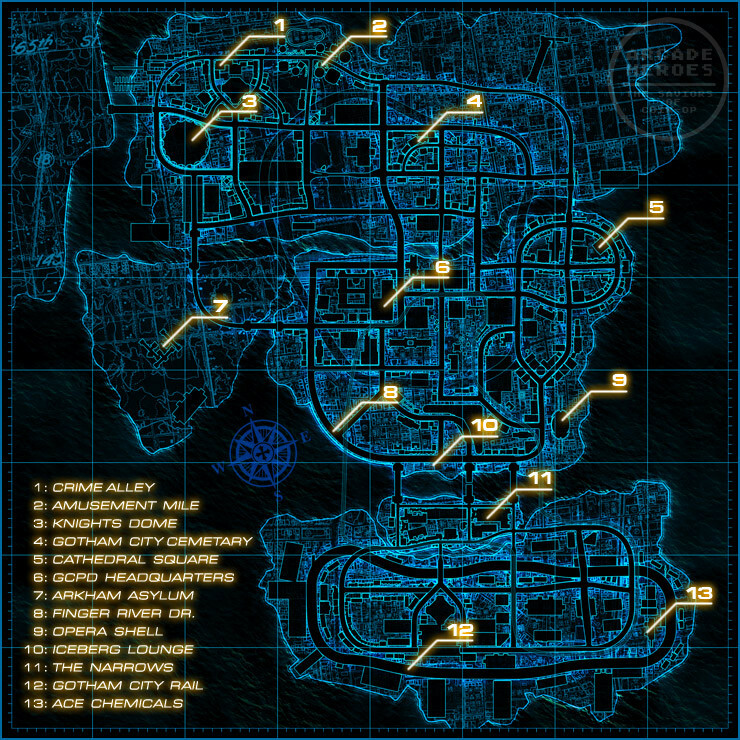 And in multiplayer, it became even more important to allow players to separate for many of the missions so they can each use their knowledge of the city to their advantage. AH: Can you describe how the multiplayer works and why it was limited to two cabinets? SR: Players can play Batman in either single player mode or 2-player competitive-cooperative multiplayer. We limit the number of players to 2 because 3 or 4 players made the game feel cramped and frustrating. There’s so much action with just 1 or 2 players, that with any more players things just became complete chaos. Turns out that a Dynamic Duo is perfect for the game. In multiplayer, some missions keep the players together whereas others allow the player to accomplish their goals independently. There are a limited number of enemies & targets in each mission, so although the players are playing as allies, it always comes down to a fierce battle between the players to win each mission. Boss battles are even more cutthroat because the winner scores huge bonuses which can sway the winner of the game. Defeating the boss awards the player a free play. In multiplayer, both players get a free play! AH: What was more influential to this game, the comic books, the movies, the TV shows or the other video games? SR: A lot of the guys here at Specular are huge fans of the comics, and I’m sure they drew inspiration from them. For me personally, it was the Nolan movies. AH: What was your favorite aspect of working on Batman? SR: We’re very excited about this game because it’s something different for the arcade. And that carried over to the development of the game, where almost every existing game system had to be reworked and many new game systems had to be built because the game’s design was so completely different from anything Specular had done previously. So it was all fresh and new to us, and that’s always a lot of fun. AH: From the picture we first saw of the cabinet, it looks like it has some back-lit display items on the control panel, much like Dirty Drivin’ did. Could you describe those? SR: These cosmetic back-lit displays are used by the game to heighten certain events, such as mission briefings, enemy take-downs, Batmobile wipeouts, etc. Raw Thrills built amazing lighting capabilities into the cabinet, including a giant lit bat-signal which the game animates. AH: Is there any more technical information you can get into about Batman? How does it stack up against some other recent arcade releases in this regard? SR: Batman is the most technically advanced game Specular has developed to date. The performance demands of rendering a huge city with tens of thousands of lights and objects, coupled with arcade hardware constraints required us to discard the proprietary game engine we used for H2O and DD, and rewrite a much more powerful rendering engine that could handle the load of the game while working within the limitations of the hardware we had available. The end result is a smooth 60 FPS, even with multiplayer. AH: Were there any software or hardware features that were planned for the game at some point but didn’t make it into the final cut? SR: Oh yes, as always! When Specular first pitched the game, we included a concept for the cabinet. As part of our concept, we wanted to include a small secondary LCD display on the dash below the main display, where we’d provide mission based info. But it ultimately proved too expensive and so we dropped the idea. We also initially wanted a control lever to the right of the steering wheel. The player would use the lever to fire weapons and boosters. But in practice, we felt the control made the game too complex, and so we instead went with thumb buttons on the steering wheel, which feel very natural. Specular also toyed around with the idea of actually projecting the bat-signal onto the ceiling or wall of the arcade! AH: A game like this is probably heavy on the voice acting given the characters, how did you go about this stage of the development? Did any Specular team members do some voice work or is that mostly a contractual source? SR: There are nearly 1,000 lines of dialog among the 20 characters in the game. It took months to cast voice actors, record the dialog, process the files, filter out the unwanted takes, balance the volume levels, get everything into the game, and test and iterate. It took an additional few months to animate the characters to the dialog. Any mistakes could have required us to call back the actors for costly pickup sessions, but fortunately we did solid work in pre-production and ended up not needing any additional sessions. One of the voice actors was Brian Silva, Specular’s Creative Director. He did several voices for the game, and he’s also the voice behind H2Overdrive and the original Hydro Thunder. I would like to once again thank Steven Ranck and Specular Interactive for the opportunity to talk about their latest work. It’s always great to get a behind-the-scenes look at a game. BATMAN starts shipping in limited quantities in this month and the next, with full distribution to begin in January. So chances are you will be able to find the game at an arcade near you during the holidays. I’m really interested in this one. Is this something you can acquire for your arcade, Adam? The price I’ve seen is around $7300-$7800. I imagine a second screen could have added at least a few hundred more – probably making the game pass the $8k mark. Seems RT has been doing fairly well by staying in the $6-7k range. I know it wouldn’t maybe be a great business decision for them…(market first and also number of employee I guess) but I wish their games were available on more hardware… never got the chance to cross an H2Overdrive or Dirty Driving cabinet here in east of France. 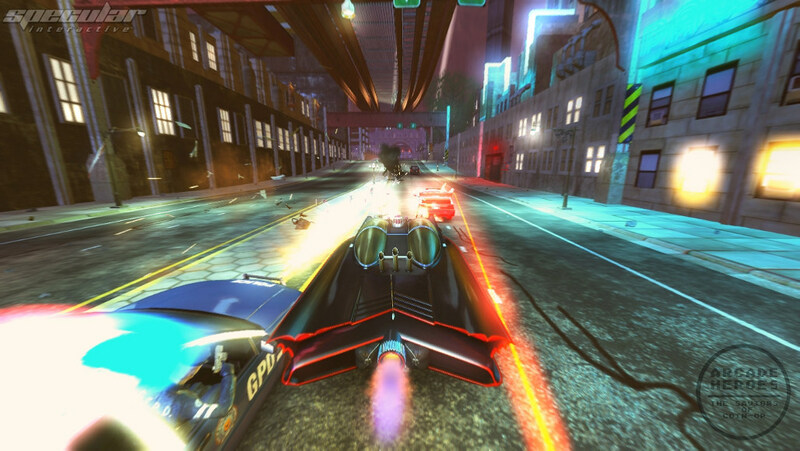 But well lets back to the topic, a Batmobile arcade game from the people behind Hydro Thunder, it’s excellent! Love the 60fps and the arcade, gameplay. My only complain from the video, which is hard to judge, graphically wise the city seems a bit generic… but again thats a bit hard to judge in a video s maybe it is not.